Gorgeous New Home. 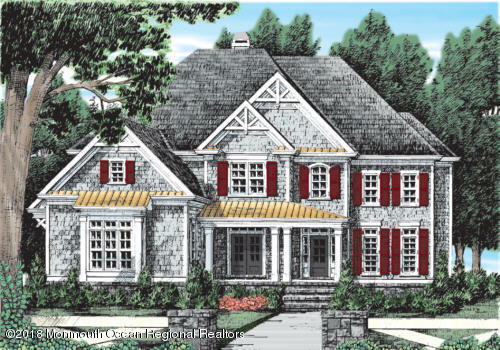 LAST HOME available for sale at The Estates at Holmdel Fields. This large custom home on a 1.66 acre lot in an upscale enclave of 19 homes, with no HOA (hence No HOA fees), features extraordinary indoor and outdoor living spaces. A rear covered entertainment terrace is over 500 square feet and has access through 2 pairs of French doors, from family room with a coffered ceiling & gas fire place. The front covered porch is about 400 square feet and has dual access to the home including the grand main entrance with volume space and a second entrance to a mud room w closet, built-ins and powder room. The gourmet kitchen features a large island and a defined breakfast nook and a butlers pantry. Builders own custom home surrounded by the privacy of Holmdel Park. Attention to detail and luxuries of only the finest selections adorn this Stately Manor. 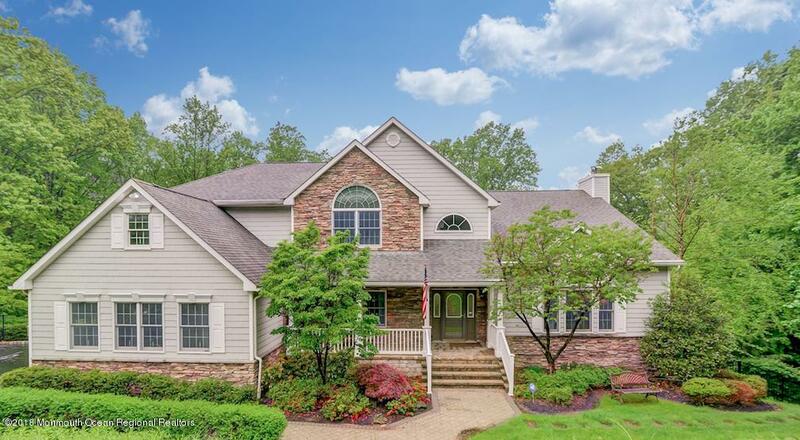 Custom Kitchen, moulding, 10 zone radiant heat, wine cellar, 12 seat movie theater, in law suite/maids quarters, 4 car heated garage, full walk out finished basement, wet bars, custom surround sound, mahogany doors, and so much more all in one of the most prestigious areas of Holmdel. 5,596 sq ft plus a finished 2798 sq ft. basement with 11 ft ceilings boasting a full 8,300 sq ft of gorgeous finished living space. Listed by Prime Time Real Estate Inc. 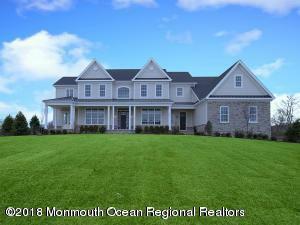 Exquisite custom 4/5 bedroom home with 6 full baths. Stately brick front home on level property with public sewer & water. Enter the 2 story foyer & see the floating staircase that leads you to a master suite & 3 additional bedrooms each with it's own bath! Gourmet kitchen opens to great room with floor to ceiling windows. Separate dining and living rooms as well as a office with a FP. Full finished walkout basement has 5th bedroom and 6th bath. HSA HOME WARRANTY INCLUDED. A MUST SEE! 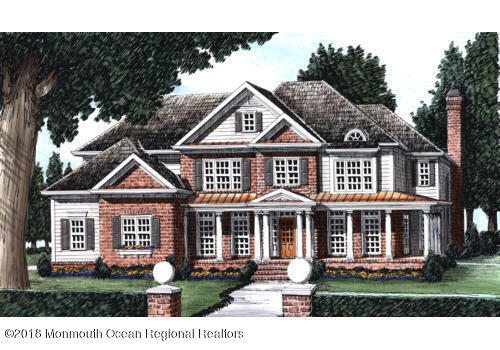 Located in prestigious Holmdel, Reserve at Holmdel is situated within the natural beauty of the surrounding areas. It is easily accessible from major highways and minutes from area shopping malls, golf courses, and the PNC Bank Arts Center. These luxurious estate homes on home sites of 1 to 3 acres feature 4 bedrooms, 3-car garages, 10-foot first-floor ceilings and 9-foot second-floor ceilings. If your idea of dream-home perfection begins with an airy and expansive floor plan, the Duncan may be the one for you! When you need respite, the private study, entered through eight-foot-tall double doors, offers a sense of seclusion. You'll welcome friends in the grand two-story foyer, which opens to the living room and the formal dining room, and boasts a stunning view of the curved staircase. Welcome to Park View Estates offering Spectacular Custom Built homes to be constructed in a quiet country setting adjoining Bayonet Park. Homes range from 3300 square feet and up with and are priced from $999,000.Homes are to be constructed once the buyer has selected one of the plans and made their selections. 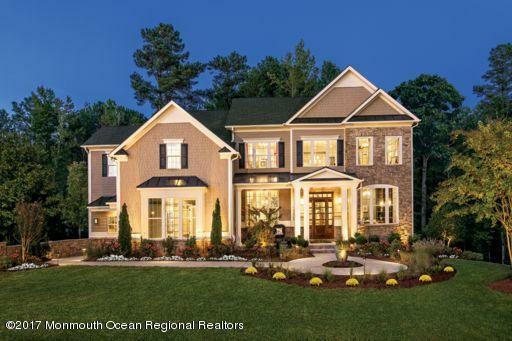 Models shown in photos are of previously designed homes offered for this site or have been built in other locations.One Mile from Garden State Parkway and Bellworks and just a few miles to North Jersey Coastline to NYC by train. Just a short ride to Downtown RedBank, Beaches and shopping.